Reluctant star of the honking sax style that defined rock in the late 1940’s and early 1950’s, whose success with raunchy instrumentals took him further away from his first love of jazz but throughout his nearly one hundred years of life have proven to be his greatest claim to fame. Hal Singer was born in 1919 and like many of that generation began playing professionally in the various territory bands of the 1930’s. His first notable position in a nationally known outfit came when he worked with Jay McShann in the early 1940’s before settling in New York’s vibrant jazz scene. Singer cut his first sides with Roy Eldridge in 1944 but it was in 1947 that he took the first steps towards a different pursuit when he was employed by King Records to back a wide array of vocalists as the year wound down and an extended recording ban was to start as 1948 kicked-off. 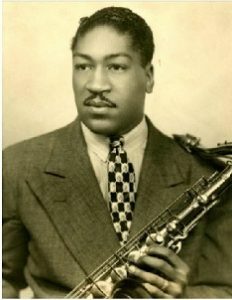 Among the records he was prominently featured on was Wynonie Harris’s “Good Rockin’ Tonight”, with Harris exhorting him on using the nickname “Oklahoma” after the state of Singer’s birth, as his muscular sax helped to set the tone that both the song and the rock style itself thrived on. At the same time however Singer realized a lifelong dream when he was hired by Duke Ellington to help anchor his horn section, which was just about the pinnacle of success for non-featured musicians in the 1940’s. Before he got fully settled into his new gig however he was offered cash to cut clandestine sessions for Savoy in violation of the musician’s strike and he accepted. The second of these, in June 1948, as “Good Rockin’ Tonight” was sitting at #1 on the Billboard Race charts, the first rock record to reach that plateau, Singer cut a record that would soon join it at the top of the listings, a honking slice of primal rock called “Cornbread”. Suddenly his career was irrevocably altered. As the possessor of the biggest hit in the rock kingdom at a time when the saxophone was the dominant instrument in the field Singer departed Ellington and formed his own headlining band and toured the country playing music he clearly looked down upon. When follow-up records were called for Singer had little choice but to replicate the sensationalistic displays that had gotten him this far to begin with, further cementing his image as a garish rocker. Though only one of his subsequent records in this style charted they sold well enough to keep him in demand, both as a live attraction and as a sessionist playing behind such notable rock stars over the years as Little Esther, Mickey “Guitar” Baker, The Four Buddies, Annie Laurie, Titus Turner, Bill Doggett and Little Willie John. Even when his own recording pace slowed he was still in demand as a bandleader on rock package tours. Finally by the 1960’s when the saxophone’s role in rock was largely subjugated by the guitar Singer departed rock – and America – and settled in France where he was free to play the type of music he’d preferred all along, though he did occasionally back visiting bluesman such as T-Bone Walker and Eddie “Cleanhead” Vinson. He frequently toured the world, especially Europe and Africa, while finding time to appear in a movie along the way, and his acclaim in his adopted home country was so wide that he received two of France’s highest designations in the arts… all of this because… or in spite of… his slumming in rock ‘n’ roll for more than a decade. As sideman… behind Jimmy “Baby Face” Lewis.